Between the two world wars Floriana FC dominated Maltese football together with their all-time rivals Sliema Wanderers. But, it seems, they always found it difficult to sign a reliable centre forward. In those days, the Greens were always well served on the wings and in the inside forward positions but somehow they never could find an outstanding leader in attack. They yearned for somebody like Tony Nicholl but centre forwards of that calibre come only once in a lifetime. In 1936, however, the Greens seemed to have solved all their problems when they signed ex-Millwall striker George Bond. Bond arrived in Malta on July 31, 1936 with a steamer from Sicily along with centre-half Vickers, full-back Dunne and inside-left Harold Herbert, son of the great Floriana star Jack Herbert. Bond settled down immediately at Floriana, adding the punch which was so badly needed in the Greens' front line. In his first season, he scored three important goals from six matches to win his first championship medal. That season he also showed his worth with a couple of first class performances in tourneys against SK Hungaria and Rapid Vienna. He also helped Floriana win the Cassar Cup after beating Hibs 7-0 in the final. The following season, with Bond leading their attack, the Greens were firm favourites to retain the championship but the Wanderers had other ideas. The first round match between the two rivals finished in a 1-1 draw but the Blues won the second round encounter 3-2 to claim the title. The Greens were disappointed but with Bond in his brilliant best they pulled the carpet from under the Wanderers' feet in the final of the FA Trophy. The Greens won 2-1 to land the last major honour of the season. During that year, Bond was chosen to represent Malta against Ferencvaros. It was, however, a disappointing experience for him and his colleagues because the locals were beaten 12-3 by the Hungarians. In 1938-39, Floriana were disbanded and Bond was for the most part of the season inactive although he did make a solitary appearance for Floriana Tigers in the league. The next season, however, he joined Sliema as a replacement for Salvu Sammut who had signed for St George's. Forming a formidable attacking partnership with Nicholl, he played perhaps his best football during his time in Malta. It was another great season for Bond, winning the Championship, the FA Trophy and the Cassar Cup in his one and only campaign with the Wanderers. 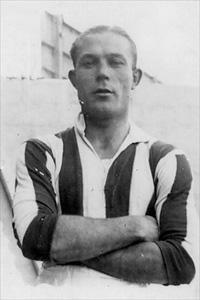 The war interrupted his stay here but in 1943-44 he wore the colours of Floriana FC once again. That was not a good period for the Greens. All the pre-war stars were aging rapidly and the team badly needed some new blood to give it a new lease of life. The Greens reached both the Malta Cup and Cassar Cup finals but on each occasion they had to bow down to their rivals from Valletta. That was Bond's last season in Malta. After that day we lost track of the bustling forward. I have a hunch though that he may have settled here. There are a dozen or so Bonds in the telephone directory which could be his relatives. Maybe someone who knows what happened to this great centre-forward could write and tell us more about him. League Championship: Floriana - 1936-37. Sliema Wanderers - 1939-40. FA Trophy: Floriana - 1937-38. Sliema Wanderers - 1939-40. Division One B League: Tigers FC - 1938-39.